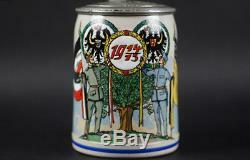 1914-15 GERMAN/ AUSTRO-HUNGARIAN Military BEER STEIN. 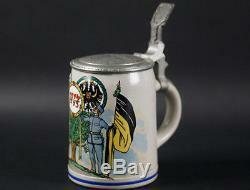 Beautiful hand painted mid-war military stein having decorative hand-tooled 1914 lid and Iron Cross thumb lift - one-of-a-kind -MINT! Guaranteed original as described; COA on request. See our other current auctions for similar original items. This is due to the imposed liabilities on Sellers... 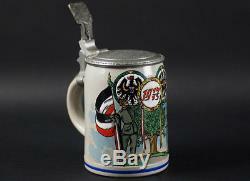 The item "WWI GERMAN / AUSTRIAN MILITARY BEER STEIN withTOOLED LID, 1914-15" is in sale since Saturday, December 29, 2018. 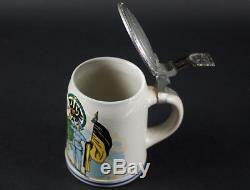 This item is in the category "Collectibles\Militaria\WW I (1914-18)\Original Period Items\Germany\Personal, Field Gear". 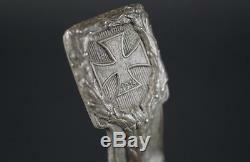 The seller is "antiquesarmsandarmor" and is located in Trabuco Canyon, California.